I'm back with another book review! This week, it My Kind of Crazy by Robin Reul. Thanks so much to Raincoast Books for providing me with an eARC in exchange for an honest review of this book. All opinions are my own. I have to say, this was a very interesting story. Going in, I wasn't sure what to really expect. The main character, Hank, hasn't had the greatest life. His mom and brother died in a car accident and his dad sits at home watching baseball drinking away his sorrows. But still, Hank tries not to let his past define him. 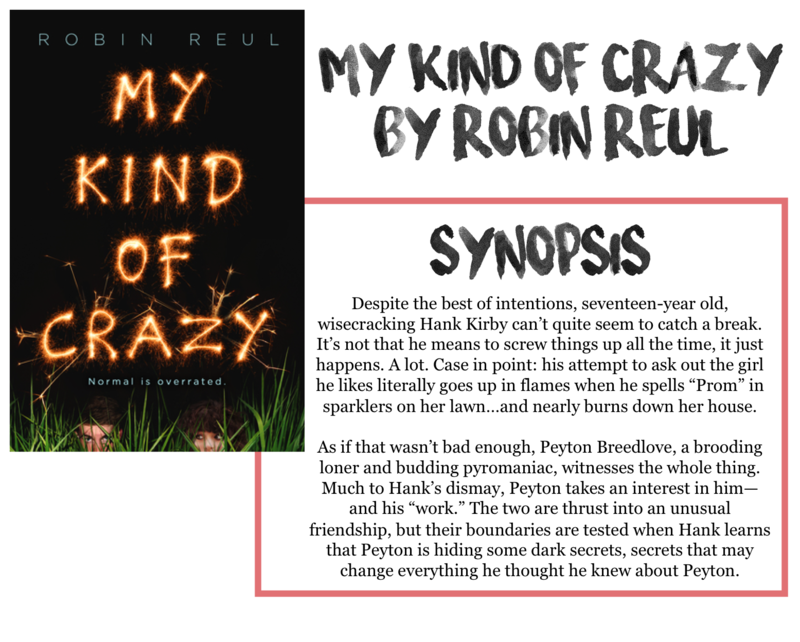 He meets Peyton, a girl who has issues of her own. Together they form an interesting relationship dynamic. Obviously, the relationship does turn romantic, fairly early on, and I think perhaps that was the biggest issue I had with this book. I felt, not that it was Insta-love, but that it was just an unnecessary turn. Peyton showed interest in Hank from the get-go and it takes Hank a little longer to get with the program. I think this story would have been better off if the relationship stayed platonic. The romance, to me, seemed unnecessary. This story was more than I was expecting, it definitely had some turns that I didn't see coming. The whole situation with Peyton and her backstory, it was very moving. I really enjoyed the writing, it's not often in YA you see a male narration and I enjoyed his insight. Looking back now, it actually reminds me a little bit of Paper Towns. The male narrator, a broken girl, although this one seemed a little more willing to be helped. Plus, there were definitely a lot of great quotes throughout as well. Overall, I enjoyed this unique and well written story and would definitely check it out if you are looking for a different, YA read!